Kingdom of God Media: Bad Religion -- "Sorrow"
Bad Religion -- "American Jesus"
Bad Religion -- "New Dark Ages"
I appreciate the honesty of any band willing to call themselves "Bad Religion." This simple phrase communicates a lot. What is religion, after all? It is man-mad methodology. Do men naturally understand God? No. Therefore let's be slow to trust any religion designed by men to bridge the gap between men and God. 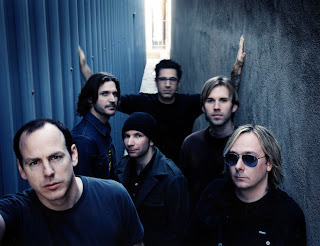 It is obvious that Bad Religion's lyricists at least (either Brett Gurewitz or Greg Graffin) desire a genuine quality of faith, or knowledge of God. The lyrics of "Sorrow" demonstrates this. "Father can you hear me? and all the sorrow in this world"
It is appropriate to ask questions about the ways things are. Anyone who desires openness before God should ask Him about anything that seems wrong or unjust. God Himself desires justice; He will teach us the most effective way to desire justice ourselves. a reason for the suffering and this long misery..."
God wants us to ask Him why there is suffering in the world. His answer is: All is not lost. Christ has redeemed even suffering. Christ so thoroughly redeems people that those who follow Him can benefit from inevitable suffering. Suffering is unavoidable, but such is God's genius that we can get to know Jesus Christ more through this suffering. between a prideful father and his son"
Humans suffer because of other humans. Our propensity for destroying ourselves and others should remind us how much we need God's unconditional mercy (mercy is needed where a person cannot help themselves). And there will be sorrow no more"
Yes, there is gross injustice in the world. Why? Where does it come from? It comes from people. The further we stray from God's rules, the more we damage ourselves and others. Therefore our best option is to obey God, or play by His rules. We don't obey God either because we love evil or because we don't trust God. Jesus Christ came to destroy these obstacles. Acquiring power at the cost of others makes sense from a worldly perspective: "Take care of #1," right? This feels like the right thing to do for the few who end up on top. The men in power are not the ones on the battlefield. But Jesus outsmarted this: He teaches His followers to give up all attempts to acquire power in favor of trusting God. God, the Originator of all power, gives and takes away power as He sees fit. Natural men are inclined to elevate themselves above other people. Jesus also outsmarted this by teaching His followers to trust God to provide and defend them. Did someone steal your jacket? Go ahead and give him your shirt also. Did someone force you to carry his belongings one mile? Choose on your own volition to walk two (check out the Sermon on the Mount in Matthew). Giving is love's way of taking control. Give and love not because you are forced to, but because you choose to. This is Christ's solution for injustice in the world. FYI - Brett has stated that "Sorrow" was written about the Book of Job. He said, "My interpretation of the story of Job is that it doesn't matter how good you are , the universe doesn't run on the merit system. In other words its impossible to justify the suffering in the world with the existence of a god." Interesting interpretation, but I would point out "just to settle a bet that could not be won, between a prideful father and his son". I think this is self explanatory. Mr. Brett really pointed out that this song is about Job. The line that you mentioned pertains to God betting that Job will still be faithful to God even though Satan will try to crush him.